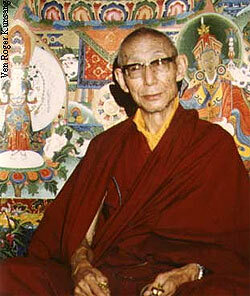 One of the foremost Tibetan Buddhist masters of our time, His Holiness Kyabje Trijang Rinpoche was the Fourteenth Dalai Lama’s philosophical assistant and later his personal junior tutor for more than forty years. A direct disciple of the great Pabongka Rinpoche, Trijang Rinpoche edited Pabongka Rinpoche’s Liberation in the Palm of Your Hand – one of the most-studied Lam-Rim texts in the Gelugpa lineage. The spreading of Dharma in the West is directly and indirectly connected with Trijang Rinpoche, due to his own teachings, as well as the activities of his disciples, including Lama Yeshe, Lama Zopa Rinpoche, Geshe Rabten, Kyabje Zong Rinpoche and many others. His reincarnation, a fully-ordained seventeen year-old named Tenzin Losang Gyatso, is engaged in Buddhist studies at the Center for Buddhist Studies Rabten Choeling in Switzerland.